The top-selling Honda, the CR-V SUV, is a bit bigger for 2017 and offers its first turbocharged engine for stronger performance. The 2017 CR-V interior has a higher quality look and is quieter than its predecessor, and the all-wheel drive system is improved, too. The restyled, five-seat, CR-V also leads other 2017 non-hybrid, non-electric, compact SUVs in fuel economy. U.S. government ratings for the new CR-V are as high as 28 miles per gallon in city driving and 34 mpg on highways with the new, 190-horsepower, turbo engine. The 2017 CR-V also earned an overall five out of five stars for occupant protection in U.S. government crash tests, but a rating of only three out of five for predicted reliability by Consumer Reports magazine. The cost has increased slightly, with the manufacturer’s suggested retail price, including destination charge, of $24,985 for the base, front-wheel drive, 2017 CR-V LX vs. $24,745 for the comparable 2016 CR-V. The base 2017 LX models — two-wheel drive and all-wheel drive — come with last year’s non-turbo, 184-horsepower four cylinder, while higher trim level CR-Vs in 2017 have the new turbo engine. Turbo models carry retail prices starting at $27,735. All CR-Vs come with a continuously variable transmission (CVT) that optimizes fuel efficiency. But for 2017 the CVT is updated so its operation feels more like that of a traditional automatic transmission. The CVT in the 2017 CR-V also allows three drive modes, including a Sport mode that is programmed for a sportier performance. CR-V sales in the U.S. so far this year are on pace to surpass last year’s record of 357,335, which made the CR-V the best-selling SUV in the country. 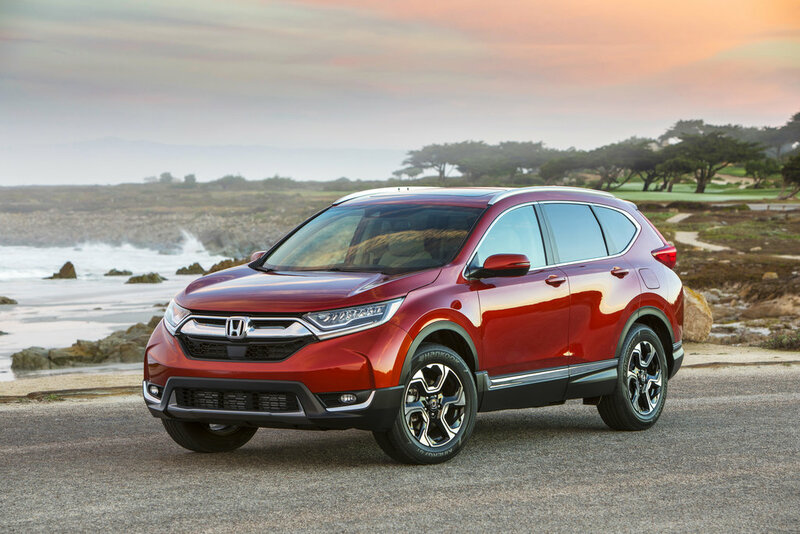 Since its introduction in 1997, the CR-V has been a versatile, smaller-sized SUV. The 2017 CR-V builds on this foundation and adds more upscale materials inside plus new exterior styling and larger-size base wheels for a more polished look. Standard equipment on every CR-V includes a rearview camera, Bluetooth hands-free phone connectivity, Bluetooth streaming audio, 12-volt power outlets, USB connection, digital speedometer, automatic climate control, six air bags and a center console with sliding armrest. The test CR-V was a top-of-the-line AWD Touring model with no options and a retail price, including destination charge, of $34,595. Wearing the largest CR-V tires — 18-inchers — the vehicle provided a comfortable, though firm, ride on roads. In aggressive turns and curves, there was a hint of tippiness to the 5.4-foot-tall vehicle, but the CR-V maintained its composure. The 1.5-liter, double overhead cam, single-scroll turbo engine generates its peak torque of 179 foot-pounds by the time the engine reaches 2,000 rpm and carries the power through to 5,000 rpm, so this CR-V is quicker than its predecessors. As a comparison, the carryover, 184-horsepower, 2.4-liter, four-cylinder engine that’s in the base CR-V produces the nearly same torque — 180 foot-pounds — at a higher 3,900 rpm. The test CR-V had some turbo lag, but once the engine power came on, it moved forward eagerly. City mileage was less than the government’s 27-mpg rating, but highway fuel economy was impressive at more than 30 mpg. Honda improved the steering substantially. The test CR-V responded quickly to driver inputs and conveyed a feeling of tight control, which is better than the steering in most SUVs. Although the new CR-V is quieter inside than its predecessor, it is not soundproof. Road noise was especially prevalent on rough road surfaces. Passengers sit up from the road and have good views, yet getting in and out doesn’t require a big scramble upward. Doors open a full 90 degrees, so they don’t hamper access. The CR-V added just over an inch in length and width and is taller for 2017. It has more front and rear headroom and 40.4 inches of rear-seat legroom. The back-seat floor is nearly flat, and passengers in the test CR-V could extend and stretch their legs. The vehicle has more room for carrying stuff, too, as cargo room increased to a maximum 75.8 cubic feet from last year’s 70.9 cubic feet. Towing capacity remains at 1,500 pounds. Tags: CR-V 2017, honda, Performance, Turbocharged Engine. Bookmark the permalink.